The sky hold hints of sunrise color, a thin line of purple on the horizon. 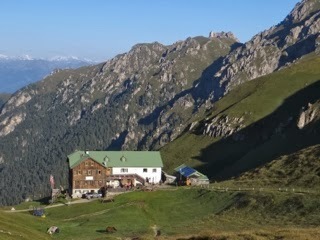 Excited for a day with views we eat breakfast consisting of bread, butter, jam, cheese, few pieces of salami, hot beverage and a cup of juice (this “mountaineering” breakfast costs €8.00 and is not as good as in Refugio Plose) and we are on foot by 8:00 a.m.
At first the route climbs a hillside to the top of a small ridge. 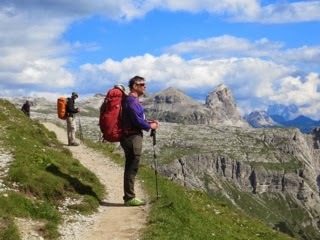 The trail is in good condition and wide, to my liking, as it leads along few cliffs. 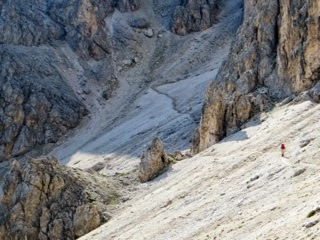 Once we top, the view of another stage of today’s journey opens in front of us, and it’s not one I like. 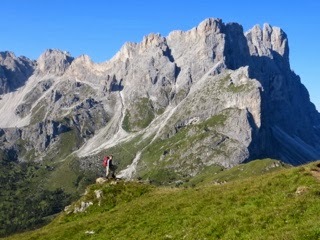 The landscape is gorgeous, high towering mountains set in an alpine scenery of green pastures. 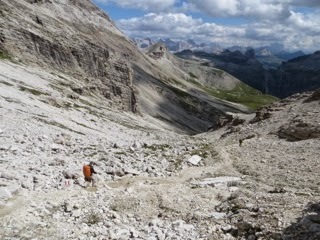 After an easy traverse, the trail climbs a steep, semi exposed gully towards Forcella della Roa. From this vantage point I’m thinking there’s no way I’m going anywhere near the deadly scree filled slope. An hour later I find out that the slope is much less intimidating than it appeared from distance. The trail, even though steep, is not quite as exposed, the trail is well threaded and the scree holds together much better than we are used to at Pacific NW. 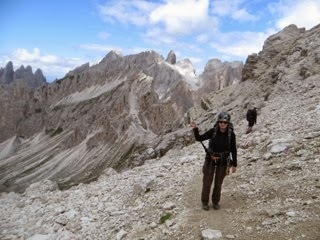 The conditions are good and we have our via ferrata gear so we take trail 3A and it turns to be a fun route with minimal exposure protected by steel cables and aided by one ladder. 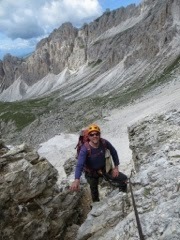 In 30 minutes we are at the plateau excited to have completed our very first via ferrata. 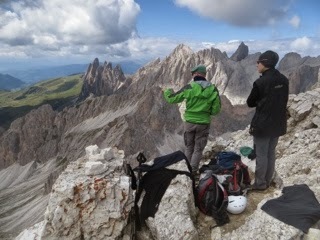 After a quick lunch we drop our packs and summit Piz Duleda, a peak rising above Forcella Della Roa. 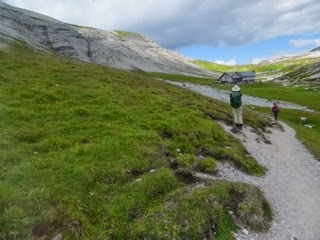 The climb starts from the plateau takes 30 minutes on easy to follow trail which except for several moves at the very top is a walk up. 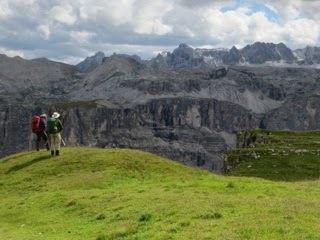 It offers 360 degree views, well worth the little effort to get there. 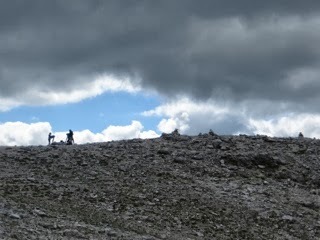 We now have about an hour to reach our destination, Refugio Puez. Still following trail 3A we drop the other side of the plateau, watching sheep grazing around us and several marmots near their grassy homes. 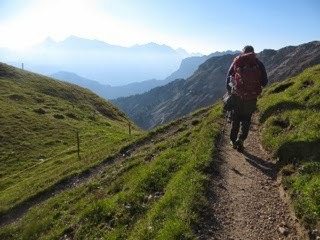 The path is good and after the initial steeper grade descents gently to a bowl where we reach a junction telling us that Puez, and more importantly some warm food, is only 30 more minutes away. 30 scenic minutes that is, the camera clicks frequently as more views open ahead of us. It’s 15:30 when we arrive. 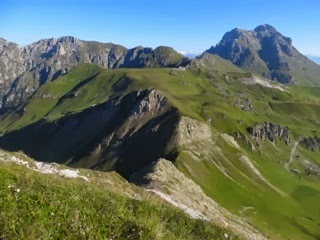 Refugio Puez is located at a junction of several routes. It fills quickly, reservations are recommended. 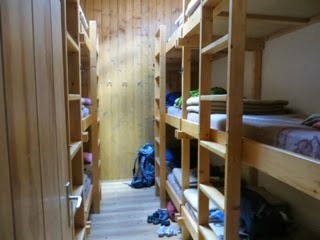 Accommodation is provided in dorm rooms, our holds 12 people in 3 level high bunk beds. Hot shower is available for 3.00 euro, sinks with hot water where one can wash up are free. Dinner is not served until 18:30 but at least we can order soup and beverages while we are waiting, and at 17:30 when electricity is turned on in the dining area, also charge our electronics. Wonderful. I want to be there. What a great post. Good job.